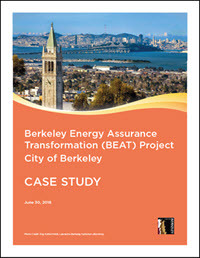 The City of Berkeley received a grant from the California Energy Commission as part of its Electric Program Investment Charge program to conduct the Berkeley Energy Assurance Transformation (BEAT) project. The BEAT project explored how to design a clean energy microgrid community (CEMC) to serve key municipal buildings and to improve community resilience by maintaining essential City functions during a major, long-term power outage. The Berkeley Microgrid is a municipally owned, community oriented, clean energy microgrids are in an early stage of development, which results in ambiguity and a lack of a clear regulatory, technical, and financial path for their successful development, implementation, and operation. One of the main objectives of this project was to make the knowledge gained from this research accessible to the public and key decision makers to advance the development of CEMCs. The BEAT project undertook regulatory, technical, and financial feasibility analyses with the purpose of producing a shovel-ready microgrid design for a microgrid in Downtown Berkeley. This Case Study consolidates findings from these analyses that are relevant to other jurisdictions, and presents outcomes, lessons learned, and recommendations for developing CEMCs in urban areas in California and beyond. Download this case study to lean how the City of Berkeley designed a replicable, clean energy microgrid community in a dense urban area that contributes to both safety and sustainability.